With Acana Ranchlands, you can serve your cat or kitten a delicious dry food that is rich in various meat types. The food contains beef, bison, lamb and pork. In addition, Ranchlands also contains fresh fruit and vegetables. Cats have evolved as carnivores, biologically adapted to thrive on a diet with varied fresh meat and fresh fish, supplemented with vegetables, fruits and grasses. The products from Acana Regionals are made with ingredients that are delivered and processed fresh daily by the producer. 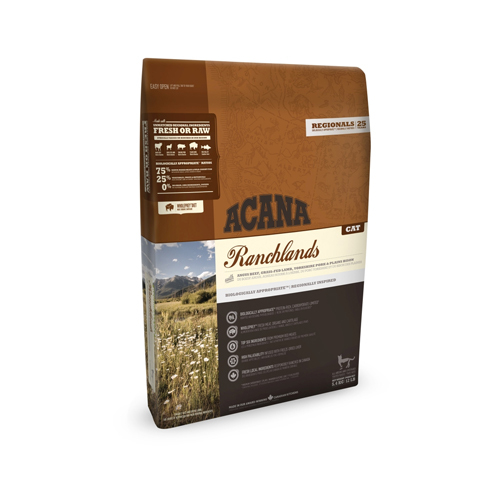 Ranchlands from Acana contains meat from Angus beef, lamb, Yorkshire pork and bison. The dry food is supplemented with fruit and vegetables such as peas, apples, pears and pumpkin. This food is suitable for cats of all breeds and ages. Acana makes its natural animal food from local products. The evolution of cats is taken into account when selecting the ingredients. Historically, their food consisted of fresh meat and was rich in protein. The ingredients are locally sourced (Alberta, Canada). Acana Biologically Appropriate is prepared with fresh meat, fresh fish, vegetables, fruit and herbs based on your cat's needs. Fresh Angus Beef (8%), raw grass-fed lamb (8%), fresh Yorkshire Pork (8%), Beef meal (8%), lamb meal (8%), pork meal (7%), whole green peas, whole red lentils, whole chickpeas, beef fat (6%), fresh beef liver (5%), fresh pork liver (4%), fresh bison (4%), fresh wild-caught walleye, whole green lentils, whole pinto beans, whole yellow peas, pollock oil (2%), fresh beef kidneys (2%), sun-dried alfalfa, dried beef cartilage (1%), raw lamb tripe, dried brown seaweed, fresh pumpkin, butternut squash, fresh parsnip, fresh kale, fresh spinach, fresh mustard seeds, fresh turnip greens, fresh carrots, fresh red apples, fresh pears, freeze dried liver (beef, lamb and pork)(0.1%), fresh cranberries, fresh blueberries, chicory root, turmeric, milk thistle, burdock root, lavender, marsh mallow, rose hip. Have you used Acana Ranchlands Cat & Kitten Regionals before? Let us know what you think about this product.